All voiceover artists come to find their niche over time. Not only the area where their best voice talents are put to use, but the method by which they apply their best marketing techniques. 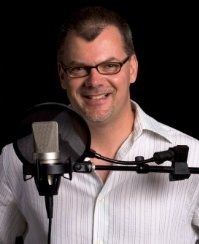 Minneapolis-based Voice-actor Terry Daniel knows how to make the most of social networking to bring in the business. More than that, he’s awful darn good at finding a way to let people know he’s good at making the most of social networking to bring in the business. Don’t believe me? Read THIS. Terry and I have struck up a personal and professional relationship over the years, partly out of respect, and partly out of realizing that we share a common geekiness about Voice acting. I’ve chosen NewMedia/Social Networking as my most favorite marketing direction. Terry and I keep stumbling into each other this way, and realized we had that common bond – so much so that we’ll be partnering to do a presentation in June of next year at VOICE2010 on social networking. Thanks for posting this, Dave! I can’t wait to do this seminar with you. We are going to have an absolute blast!